Three weeks have passed so quickly. I have been supporting lots of lessons and performances, and more independently planning for events. Working with Attik Youth up at Dartington has been really exciting! The group did their second performance in The Great Hall at Dartington Community Day on the 1st June. I was particularly proud of the group because we only had thirty minutes to prepare for the performance beforehand, due to it being half term, and the members of the group having previous commitments. They were incredibly focused: they helped to select the music, to create an improvisational score to move to and they enjoyed a vigorous group warm-up. During the performance, I admired how brave the group were- it takes a lot of confidence and drive to perform in broad daylight, where you can see the audience clearly, with no set choreography. It made me very proud to have the opportunity to work with such a talented & fearless group of young people. On a more personal note, I felt quite proud to have been giving the opportunity to lead this event. I gave a small introduction to the piece and explained the artistic, creative process behind the group piece, before performing in the improvisation with them. My final rehearsal with The Dartmouth Academy dance group was brilliant. We were based in The Flavel Theatre and it was so useful to have the group in professional theatre space. It helped them to know the exact spacing of the choreography and where to come on & offstage. Because we were in this space, I really noticed a change in the dynamic of the group- they were focused, calm and determined. It was really lovely to see them independently problem-solving. For example, when some of the unison movement seemed unclear, I asked them to teach it to me, which they found helped them to clarify it. They were also incredibly forthcoming about the movements that felt awkward or were unsure about and helped to change the movement to something new that everyone felt comfortable doing. We had five full runs of the piece in this rehearsal and during in the cool down, they said that they felt much more confident and excited about performing. Teaching this session independently was a great way to mark out how far I’ve come in this internship- I didn’t feel at all nervous beforehand and had no trouble creating exercises for the warm-up, cool- down and movement changes needed within the piece. This internship has taught me to organise my time efficiently, and to plan exercises for the class/rehearsals as soon as I know I am teaching, and then refine them on the day to the need of the group. This process gives me a lot of confidence, and has really helped me progress from an intern towards a freelance dance artist. 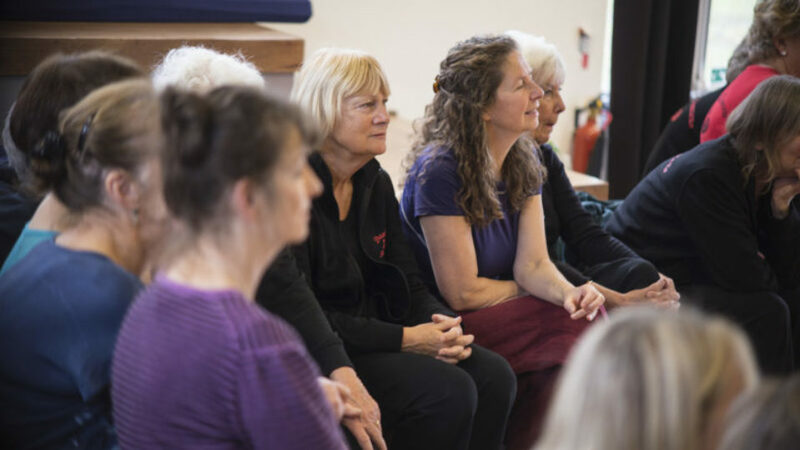 Of course, this is all because of the amount of dance and movement classes I have been able to witness & participate in during my time here at Dance in Devon, I have a much wider knowledge of different exercises, improvisation structures, warm-ups, cool-downs and practices. Last week, Dartington Community Day was another opportunity for me to expand my practice, and I feel very lucky to have run two full workshops throughout the day. I have mentioned in my previous blogs how hard it must be to plan classes for a group that you don’t know. This community day was a definite test of planning for the unknown! I had planned a lot of dance-based exercises for adults and teenagers and only a few for children. However, with guidance and some very helpful props from Sue, I was able to better plan for a workshop full of children and parents observing around the side. This was exactly what happened! The weather had made it impossible for us to assemble the tent, and so we took to the SPACE studios. This proved another challenge- getting people from the gardens down to the studios. Lauren, the volunteer for the day and myself took to handing out postcards to families and organising for them to come down at the correct time. Our first two workshops were completely empty and both Lauren and I started to lose motivation, however, the last two workshops of the day were full! In our class we did lots of prop work with a parachute and a large circular elastic with the children and I made sure to use lots of creative imagery. The first group of children were slightly older and we were able to have a little section of the workshop were they followed a ‘greetings’ dance duet, which they found very amusing. All in all, it was a fantastic day, and I was happy to realise that I have cultivated the skill to be able to teach groups that I don’t necessarily know. The day after Dartington Community Day, I performed at Plymouth Fringe Festival 2016. I danced in two professionally choreographed pieces with Spindrift Dance Company and I also debuted the choreography I created with Nadjeschda, here at Dartington as part of my internship studio time. I really enjoyed the technical rehearsal for my piece, it was brilliant to learn how to work with a lighting team and how to explain movement cues. The feedback I got from the piece was really positive, one audience member commented: ‘I have been a support worker for over five years now and your piece really defined both the positive aspects of fun & playing and some of the harsher situations we have to attend to’. From this performance, I definitely know that I want to carry on creating work after this internship ends, and I feel more prepared to do so.